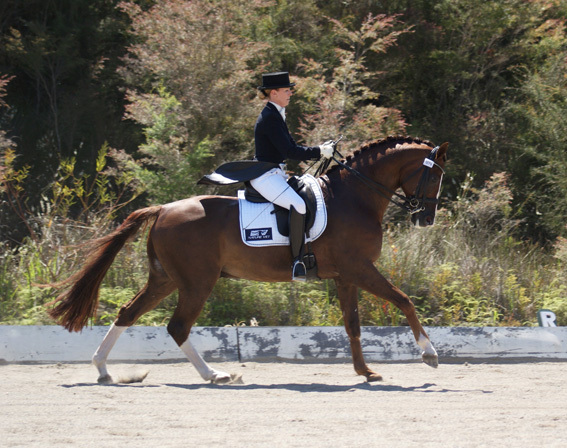 Stedinger - imported by Revelwood Stud this amazing horse quickly formed a great partnership with Gina & together they won many Championships including 2014 National Small Tour Prize. "Stedi" is a Licensed Oldenburg stallion by Sandro Hit and his damsire is Landadel. He is a sensational athlete and his desire to please the rider is second to none. He is the sire of many top class horses including Dorothee Schneider's upcoming GP horse Santiago, Andreas Helgstrand's Stamina and German Nations Cup Team horse Spirit of the Age with Bernadette Brune. Unfortunately recurrence of an old injury put a halt to Stedi & Gina's competition career just before a GP start was slated but he is enjoying his retirement at Revelwood Stud where he continues to sire future champions. Rodrigo III - Known as "the most beautiful horse in the world", "Ringo" was part of Team AWP 2012-2014 and showed Gina "the ropes" in Big Tour. 2013 & 2014 at Bradgate Park CDI in Orange with their Queen themed program. A delight to have around Ringo was invaluable and taught us lots - something he continues to do with his new owner, Young Rider Tayla Desmet. our beautiful Manuscript ("Master"), Denzel ("Nero"), Twin Alps ("Tiny"), Hand Painted ("Speedy") & Agean ("Raz') all Royal show winners in their time, & "Bambi" Gina's first pony.